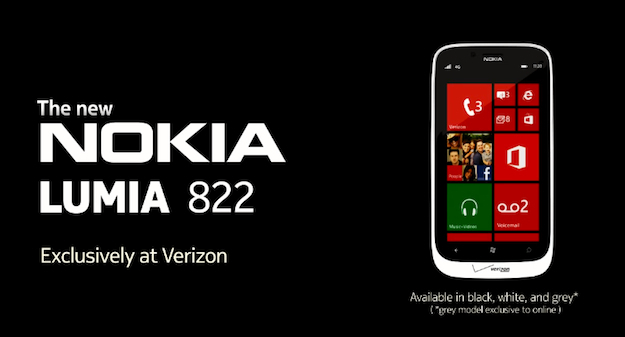 Verizon has announced the Nokia Lumia 822, a Windows Phone 8 handset exclusive to the network. The news comes a few hours ahead of Microsoft’s big Windows Phone 8 event, which will be held in San Francisco, where the last pieces of information regarding the new OS will be shared. In the meantime, lets look at the Lumia 822. The screen measures 4.3-inches and hides behind a sheet of protective Gorilla Glass, and although no resolution is mentioned in the press release, it’s likely to be the same as the GSM Lumia 820, which stands at 480 x 800 pixels. An 8-megapixel camera sits on the rear of the curvy device, complete with Carl Zeiss lens and 1080p video recording, while a 1.2-megapixel video call lens can be found above the screen around the front. Nokia makes a point to emphasize all the applications it bundles with its Lumia phones, including Nokia Maps, Nokia Drive, City Lens and the recently launched Nokia Music. This music streaming service has been out in Europe for a while, and is particularly interesting due to there being no subscription charge and no streamed advertising either. Other features include NFC, Bluetooth and a choice of black, white or an online exclusive grey color scheme, plus the chance to swap the rear cover for one that enables wireless charging. The Lumia 822 will connect to Verizon’s 4G LTE network, but aside from all this there is a lack of information on the device’s finer technical points. That won’t stop us hazarding a guess though, as the 822 will probably share the same dual-core, 1.5GHz Snapdragon processor, 1GB of RAM and 8GB of internal memory as the Lumia 820. All this is identical to the Lumia 810 too, which is exclusive to T-Mobile USA, while the Lumia 820 can only be found with AT&T. As they share the same spec sheet, the 810, 822 and 820 should really be considered network-exclusive designs, as the differences are all cosmetic. The Lumia 822 is the first Windows Phone to hit Verizon since last year, when it carried the affordable HTC 7 Trophy, and confirms rumors dating back to August of the network’s plans to once again carry handsets running Microsoft’s mobile operating system. Verizon and Nokia have so far committed only to the Lumia 822’s “upcoming availability,” so we’d expect to hear more following Microsoft’s final big reveal later today.